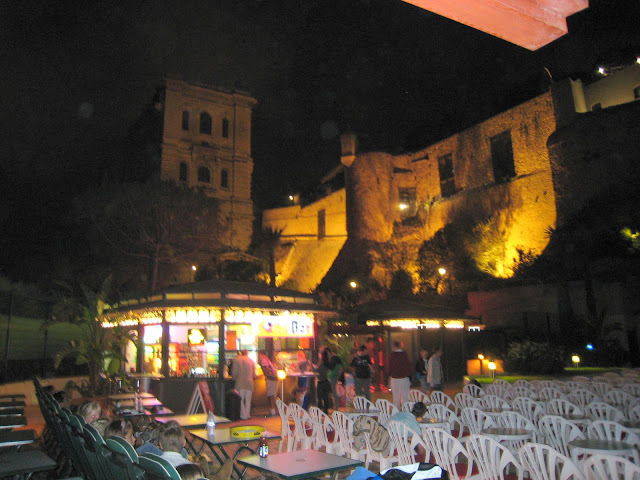 The Open Air Cinema on Le Rocher has now closed for the season. I took this photo in the summer. You can sit on the normal white chairs, or, if you don't mind paying just a little more you take one of the soft green loungers - well worth it except, with the wine you can buy, you could possibly fall asleep. Best of all, though, as you watch the film, glance up to your left and you see the Oceanographic Museum rising up in all its shadowy glory. You can see a clearer view of the cinema, looking down from above, HERE. We have outdoor movies and we try not to miss a single event. However, to miss a movie with a backdrop this this would be a sin. And your other photo with the sea behind ... wow. Monte Carlo is such a beautiful place. And the open-air cinema makes it even more attractive! I must visit Monaco one day! Have you visited The Strange Republic yet?